K'wlipai8! Welcome! The Western Abenaki language, Aln8ba8dwaw8gan (Language Code: Abe), is listed as "critically endangered" by UNESCO. For those interested in learning to speak, please add our site to your bookmarks and stop back often, also consider attending our monthly Language Immersion Camps (now with PHOTOS of past camps!). We thank you for your support in this endeavor! Agakimzi ta klozi kakaswi, adali-kizitawakw! Keep studying and speaking, while we still can! Western Abenaki is a living Eastern Algonquian language closely related to that of Pocahontas and nearly identical to that spoken by Squanto. 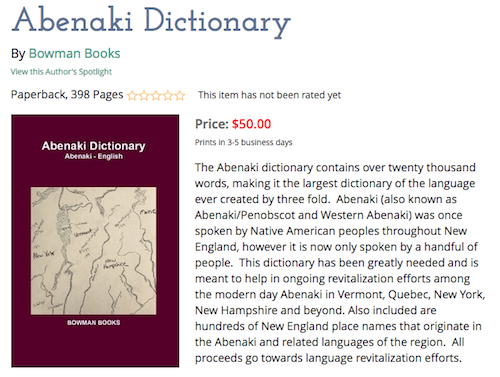 The term Western Abenaki is a new one, however the roots of the language are very ancient and diverse. Two centuries of war and disease, drove Eastern Algonquian speaking peoples north. First into north eastern New York and New England and later into lower Canada. This massive displacement caused groups from various closely related dialects to join together forming new tribal and familial bands. While most of these individual dialects are now lost, Western Abenaki has been continually spoken until present day, making it an extremely rich repository of Eastern Algonquian languages. The tribal groups who contributed to Western Abenaki are the Sokwakis, Penecooks, Cowassucks, Wampanoags, Schaghticokes, Woronoco, Mohicans, Mahicans, Nipmucks, Pocumtucks, Penobscots, Androscoggins, Missisquois, Amonoscoggins, Amoskeay, Cocheco, Coos, Nashua, Ossipee, Pemigewasset, Pequaket, Piscataqua, Souhegan, and the Winnibisauga. The origin territories of these communities covered Connecticut, Western Maine, Eastern New York, New Hampshire, Vermont and Massachussetts. Follow this link for much more! We are currently rebuilding our entire database of words. We appreciate your patience as this will be a long process. However once completed we will offer greatly improved functionality. We will also now show citations directly to all source material for every word in the database, allowing you to see each word in the context from which it was gathered. All the material included has been gathered from native speakers and essential documents they have produced. Follow this link to start searching now! Western Abenaki Radio offers fully immersive shows which include basic dialog, traditional and contemporary stories and songs, as well as lessons, news and other information all presented within the language. This is an attempt to offer a chance to hear the language being used, refresh or improve your ability to understand it, and in a small way keep the language alive. Follow this link to start listening now! Basic conversational Western Abenaki Lessons created and dictated by fluent speaker Cecile Wawanolette, alongside fun games and exercises created by Douglas Julien. This collection was made in an effort to get the language to all who wanted to learn it. We are so grateful for all the work and generosity of our late instructor in her efforts to preserve the Western Abenaki language she loved so much. Follow this link to start learning now! A complete index of the lexical sources we have used to build this site. As part of our process with each word we add to our search engine we also include a link to its source. Within our sources you will find not only words, but entire phrases and in some cases even stories, some which have not been read in hundreds of years. We are just beginning the process of adding new materials and their sources, so check back often to see this very unique and useful area of the site grow. Follow this link to review our language resources! For over 20 years we have been doing our best to revitalize the Abenaki language. A huge part of this is creating a new generation of speakers. We have been gethering together and learning the language together across the Northeast for the last two decades and have made enormous gains, but without eager students the language can not survive. Please do not hesitate to join us at any of our gatherings. You can learn more about them on this page. Scroll down for photos and descriptions of past language immersion camps and activities. We hope to see you learning by our side at the next event! Follow this link to learn more about our Language Classes! Support us with Your Donations Hosting and Bandwidth, not to mention research, programming, and data input are essential realities of WesternAbenaki.com. We need your help to make it all possible. We are a project of the Ndakinna Education Center a certified paypal 501c3 notforprofit making all your donations 100% tax deductable. Follow this link for more information about supporting WesternAbenaki.com! "Language is one of the fundamental aspects of a person's worldview and self identity." "Language is integrally related to Thought-formation. Some languages are better suited for some thoughts â€“ those thoughts related to the worldview of those who created it." ABENAKI ah-BEN-ah-kee - is a corruption of Montagnais word which refers to "the people of the dawn land." The name now refers to a group of loosely related Eastern Algonquian-speaking people who have lived in the New England area for thousands of years. The Abenaki include the Sokoki on the middle and upper Connecticut River, the Cowasuck farther upriver, the Missisquoi on Lake Champlain, the Pennacook in New Hampshire's Merrimack Valley, the Pigwacket in the White Mountains, the Androscoggin of western Maine, the Penobscot, Wawenock, and Kennebec of Maine. The Abenaki Confederacy - now called the Wabanaki Confederacy, includes the Abenaki, Penobscot, Passamaquoddy, Maliseet, and Micmac. Wabanaki is sometimes used as a collective term for the eastern Algonquian language communities. At the time of the first European contact, there were an estimated 100,000 Abenaki people living in New England and the Maritime Provinces. Featuring songs which have been on Western Abenaki Radio! We are very interested in your feedback on our dictionary and radio show. Corrections: We are far from perfect and appreciate your keen eyes and ears. While nothing will ever sound or look right to everyone, if you notice obvious typos, or misprints within our dictionary or shows, please let us know so we can make the needed corrections. Suggestions: Our attempt is to offer as much as we can and we greatly appreciate the creative input of those who are utilizing our site. If you have a suggestion to improve on any aspect of the site, whether its topics to be covered or materials to be included, please let us know! Radio Content: Please don't hesitate from bringing our attention to any songs, stories, poems or other audio based media that you would like included within our shows. We only ask that they be entirely within Abenaki in order to stick with the fully immersive format of the program. More Books and PDFs in the Western Abenaki Language!